Cinderella Glass Slipper Cookies ~ Easy Directions! We love Cinderella, and all the fun that goes along with that, especially her shoes! Here’s a cute Cinderella inspired recipe courtesy of Disney Family! Fashioned after a certain princess’s fancy footwear, this sparkly slipper makes a fun and fitting treat for any special occasion. *If the store bought brand of dough you use is too soft to hold the cookie shapes during baking, you can knead in a little extra flour to stiffen it before rolling it out. Heat the oven to the specified temperature for the cookie dough you’re using, and line a baking sheet with parchment paper. Print the template and cut out the pieces. Repeat step 2 until you’ve used up the dough (or have no more space on the baking sheet). Bake the cookies until the edges turn golden brown, about 7 to 9 minutes. Note: the time will vary between different cookie dough recipes. Once you’ve removed the cookies from the oven but while they are still on the baking sheet, place the slipper opening template atop each one and use the tip of the kitchen knife to very lightly score the baked dough along the lower edge of the paper. Use a spatula to transfer the cookies to a cooling rack. Let them cool completely. Working with one cookie at a time, spread white cookie icing on the portion below the score line. Immediately sprinkle decorating sugar crystals on the icing. 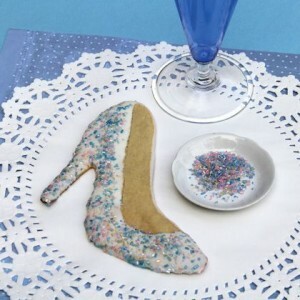 Let the icing harden completely before serving or stacking your glass slipper treats.